The Coaching function within PlayVox, if available to you, is used to provide feedback on quality issues, performance issues, or general topics. The PlayVox coaching model is unique in its approach. It is form-based. This approach supports higher frequency coaching sessions with much higher efficiency for team leaders. And for managers, it supports tracking and reporting on coaching activity as an opportunity to identify best practices or areas to improve coaching skills. The coaching form used by you as a team leader can be customized by your platform administrator to include best recommended feedback templates and coaching categories. This document reviews coaching form features, provides guidance on best practices when conducting coaching sessions, and describes the agent experience. 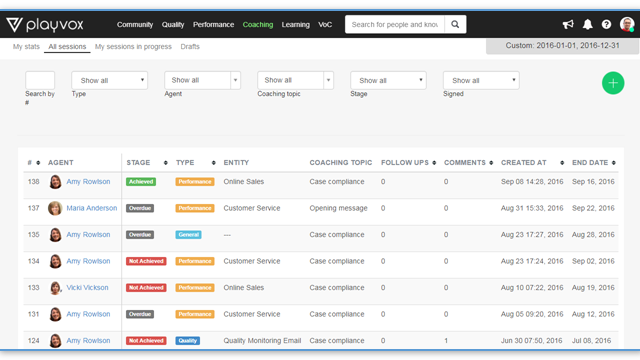 The coaching form is opened from various quality or performance dashboards. Look for the coaching icon shown below. 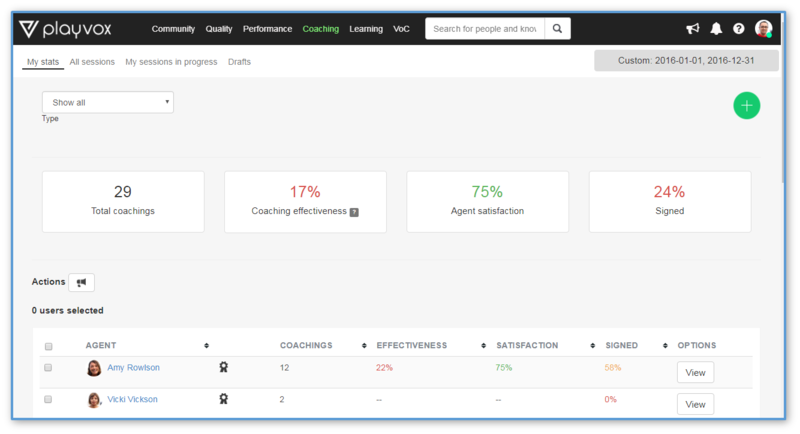 A coaching form, or session, is initiated for an agent specific to a quality or performance issue highlighted on your dashboards. The example below is for a quality score dashboard used by team leaders. A similar dashboard is available for performance management. 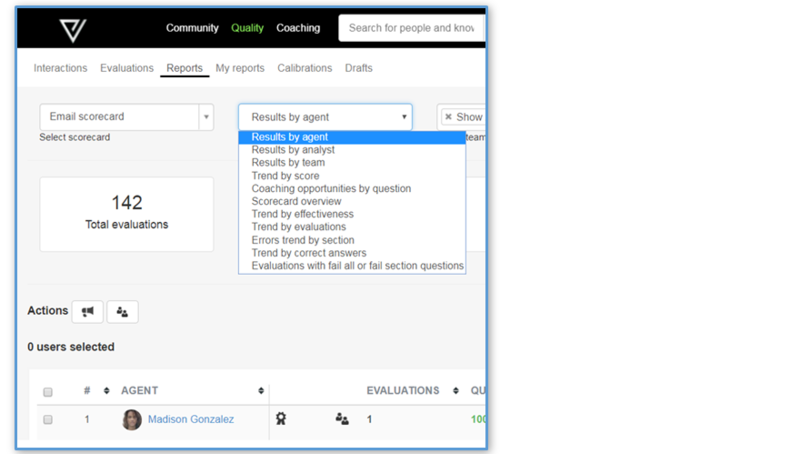 Go to Quality in the main navigation bar, Reports, Select a scorecard in use, Select Results by agent. A list of agent evaluation results will appear. This report stack ranks agents by aggregated scores for this scorecard and the time period you select. As a next best action you can choose the option to conduct a coaching session right from this dashboard. 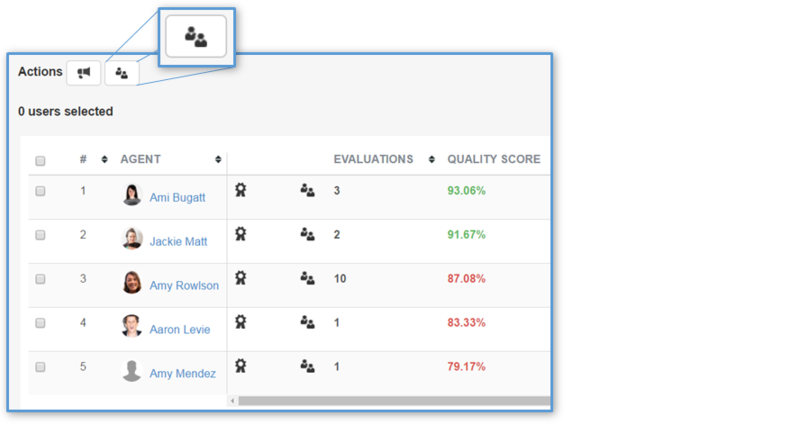 Team Leaders can also initiate a coaching session from within the Quality Evaluations dashboard. Go to Evaluations. Click on View for a specific agent evaluation. Click on the coaching icon. Likewise, for the Performance application, you can go to Performance in the main navigation bar, select reports, select a performance campaign and select the Performance by agent report. This report also provides a stack ranking of agents by aggregated performance score or by each performance KPI. This will help you understand important options you have to complete the form. To start, click on the coaching icon within a report or dashboard. Select the Coaching type. A coaching session can be initiated against a quality issue, performance issue, or a general topic. For a Quality coaching, as in this example, select a scorecard. If initiated from a quality report, the default scorecard will be highlighted for the reported issue. The name of the agent will be automatically populated based on the dashboard reference. Next, select a coaching topic from a drop down menu. These are defined as areas for improvement. This is one of the fields that your platform administrator will customize for your coaching needs. Finally, provide feedback in the free-form field. 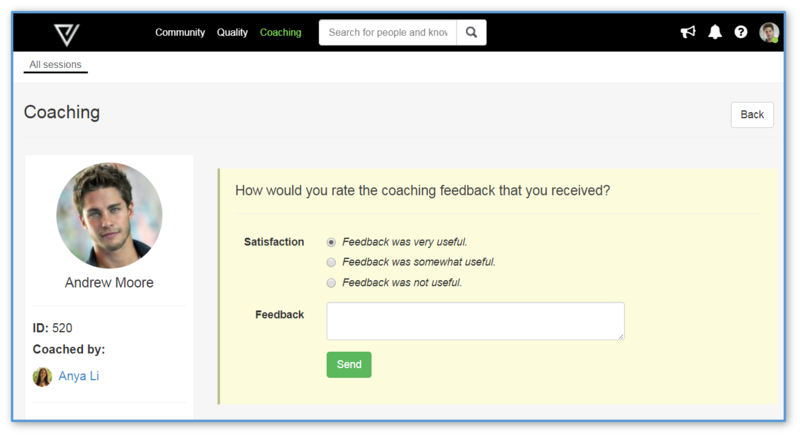 You can also select from a library of feedback templates. Feedback templates are best-recommended coaching feedback for the specific issue or area for improvement. These templates can be created by your platform administrator. Next select a set of dates for comparing quality or performance stats over two different time ranges, past and future. This is very important to you as a Team Leader. Using these two date ranges, PlayVox provides a comparison of quality or performance stats before and after coaching. The comparison of stats before and after coaching is a measure of the agent's ability to apply the feedback and also a measure of the effectiveness of the feedback provided by you for improving this issue. These comparison stats are provided in various team leader and manager reports. Note: In the case of a quality coaching session, it is important that you set an After coaching END DATE that is outside the date of the next expected quality review. This will assure a future quality evaluation has been conducted for comparison purposes. And finally, select the issue or skill that you are asking an agent to work on in the coming days and weeks. And set an incremental or step goal for the quality area or performance KPI. In the example above, the scoring factors, or sections of the quality scorecard, are automatically presented in the form to the team leader. You click on the section, or skills, to work on. Then set a goal for the agent to achieve for a next quality evaluation. 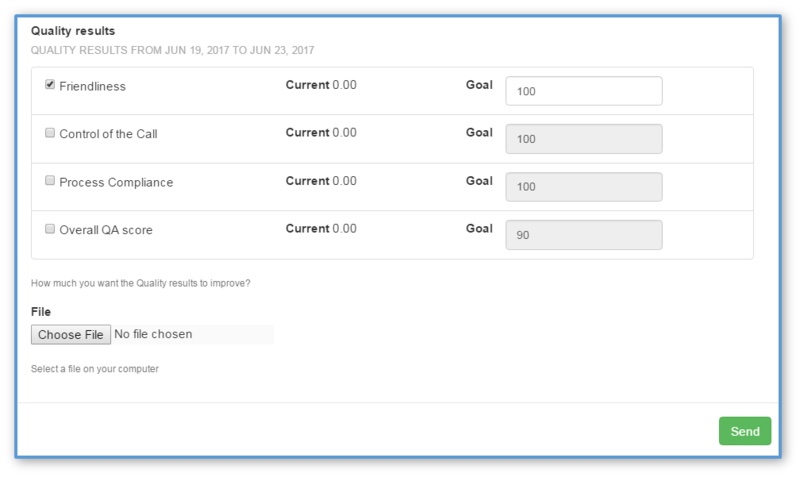 In the example of a performance coaching session, as shown below, a set of performance KPIs is automatically listed on the form with preset goals. Again you should check the box for the KPI to be improved and set an incremental step goal for the agent to achieve in the After coaching time range set. Note: Also important for you is to set realistic incremental step goals for quality score goals or KPI goals. These incremental step goals are used to determine coaching effectiveness scores for you and the agent. An effectiveness score is the total number of coaching sessions where the incremental goal was achieved as a percentage of all coaching sessions. These should be realistic achievable goals based on the agents current performance and quality measures. Finally, you can attach a file to this coaching form and click Send complete the coaching form and send it to the agent. You have access to coaching analytics under Coaching on the main menu. Coaching analytics are provided for any coaching type against quality scorecards, performance campaign KPIs, or General coaching topics. In addition to reports for coaching data, you also have access to an interactive tool for managing coaching sessions in progress. This is a very powerful tool for team leaders. 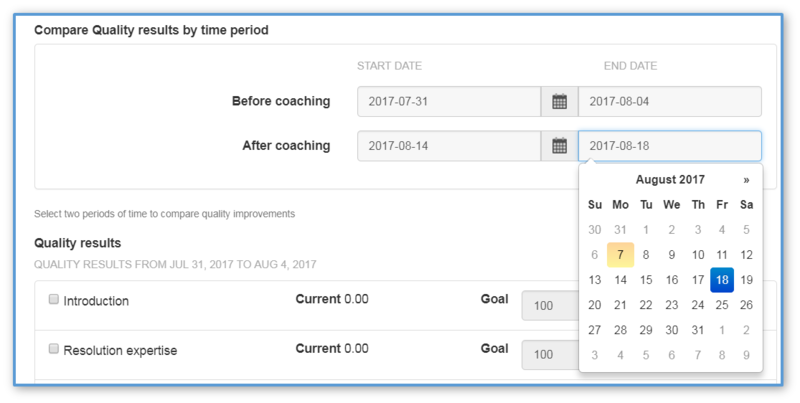 It allows you to manage your team during the time period set for improvement based on your coaching feedback. Go to Coaching in the main navigation bar and My sessions in progress in the sub-menu navigation bar. This is a card view of each coaching session in progress with goals and dates for achievement. 'In progress' is defined as within the date range that you set for After coaching in the coaching form. It allows you to move coaching session cards across four columns of progressive improvement or action. Your platform administrator defines the progressive improvement represented by the four column heads. In the example above, Initial feedback, Follow up, Needs attention, Making progress. You can use the filters to select by agents, coaching topics, type of coaching, etc. 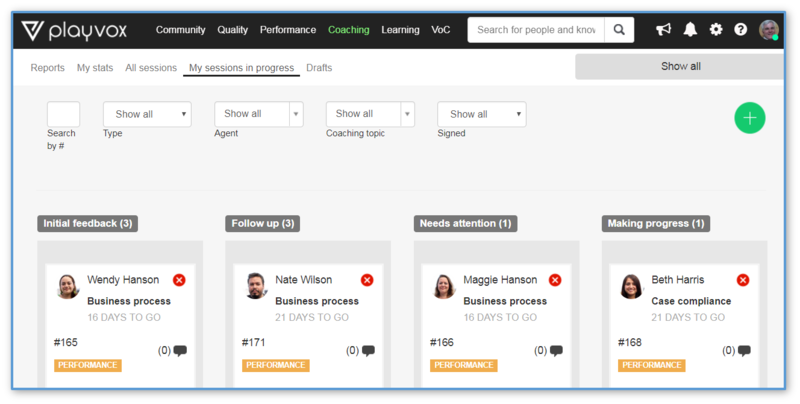 The cards can be moved across the columns as a way to visually manage your workload and coaching activities. In the example below, Jackie is being moved from the Initial feedback column to the Follow up column. Separately, under Coaching in the main menu and All sessions, you can view a list of coachings that you've conducted with vital statistics for each coaching. Type of coaching, coaching topic, etc. Data can be sorted by heading. And there are a number of filters to isolate coaching data by agent, topic, stage, etc. Lastly, there is a dashboard My stats that provides vital statistics on the effectiveness of your coachings and feedback. 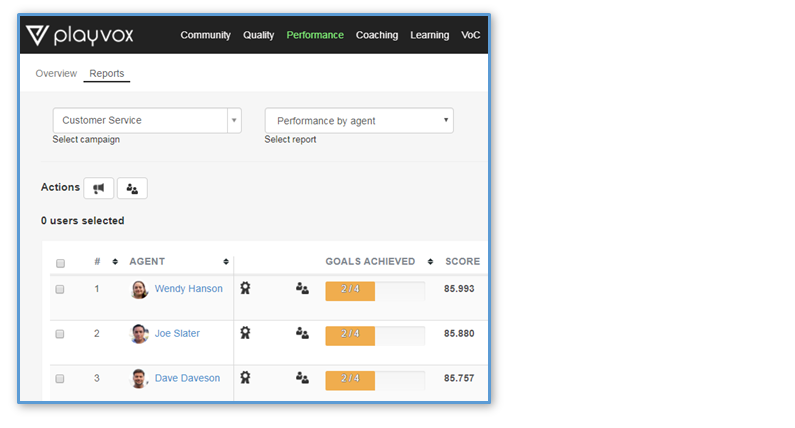 The Coaching effectiveness score provided in this dashboard is a calculation of how many coaching sessions met the goal set by you for agents for the quality scores or performance KPIs on the coaching form. In the time frame that you set. Note: You can see now why it is important to set realistic incremental step goals on the coaching forms. Your effectiveness scores will reflect your team's ability to hit their coaching form goals. Finally, this dashboard provides a satisfaction rating. This Satisfaction score is calculated based on each agent's answer to a simple question on your coaching form. Was this feedback Very useful, Somewhat useful, Not useful. Great feedback to you from your team members. Agents have a personalized dashboard not unlike your dashboards. However, they can only see their own coaching statistics. Dashboards provide aggregated data. They can also drill into each coaching session. When you submit a coaching form, agents receive a coaching notification on their dashboard. They can click on the notification and go directly to the coaching form or access it through their main coaching analytics dashboard. 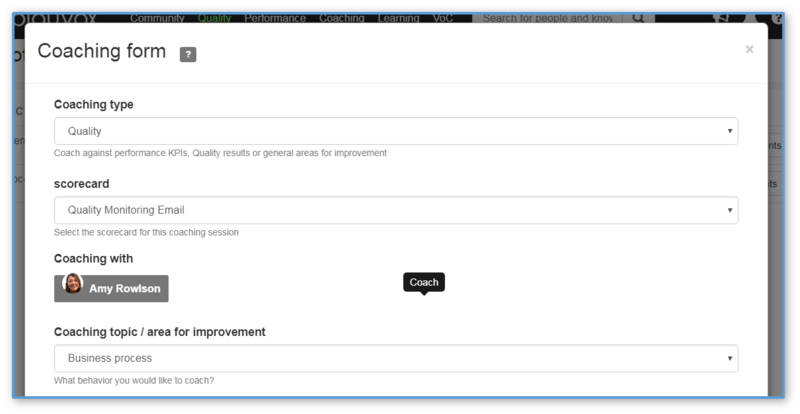 The dashboard for a specific coaching form provides your feedback and goals for quality or performance. It also provides a comparison of the quality or performance metrics prior to coaching and post coaching. Agents acknowledge receipt of the form. And remember, they can even provide a satisfaction rating for your feedback by answering one simple question. Finally, agent's can engage with you in a live chat session to ask additional questions or dispute the coaching feedback. Congratulations! You are ready to engage your team on PlayVox!